Crane Ropes, like any machine or spares, deteriorate during storage as well as in service. Therefore, the assurance of safety and economy in use of the equipment, dictates the requirement for a procedure of proper storage, handling & installation of Crane ropes. 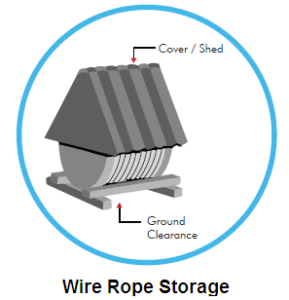 Store rope in a clean, dry, well ventilated, dust free undercover location. Cover the rope with waterproof material and/or canopy, if not stored inside. Storage should be free from steam, chemical fumes or any other corrosive agent. Avoid direct contact of rope with floor. Place reels, preferably over A-frame or cradle and allow flow of air under the reel. Avoid rope exposure to elevated temperatures. 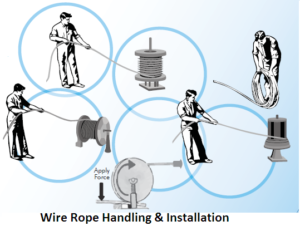 Avoid handling damages to wire ropes. Ensure that tag/marking is intact and follow ‘first in, first out’ principle. Inspect rope periodically and, apply suitable rope dressing compatible with manufactured lubricant, whenever necessary. Rotate reel periodically, say after every 3 months, particularly in warm environment. Never pull out rope from stationary coil. Place rope coil on ground and roll out straight. If heavy, place coil on turntable and pull the end away from coil. Prevent contamination with dust, grit, moisture, chemicals and other harmful material. Put a shaft, of adequate strength, through reel bore and place the reel in a suitable stand. Allow reel to rotate freely and be braked to avoid overrun. Provide back-tension for multi-layer spooling and ensure to wind tightly, particularly the bottom layer. Maintain constant tension while reeving and avoid layer cross-over. Avoid formation of loops and / or kinks. Avoid reverse bend during reeving. Wind / unwind ‘top to top’ or ‘bottom to bottom’. Take special care while releasing the outboard end of rope from supplied reel or coil. Maintain fleet angle at minimum during installation. Check that grooves of all sheaves are as recommended and sheaves are free to rotate. Check the diameter and pitch of drum grooves and ensure that these are as recommended. ‘Run in’ the new rope by running the equipment slowly, with a low load for a number of cycles. Inspect that the rope spools correctly on the drum and no slackness or cross-over occurs.